THE PEABODY MUSEUM of Harvard University owns one of the largest and most extensive archaeological collections of Peruvian textiles in the United States. Approximately 2850 specimens ranging in age from Pre-ceramic Period VI (B.C. 2500–1800) to the late Horizon (1476–1534 A.D.) document 4,000 years of technology. The physical condition of these specimens varies greatly, so that ultimate in-lab treatments will also vary. Since there is a demand to study them now, however, most on-going damage is caused by their retrieval from their haphazard and crowded storage. 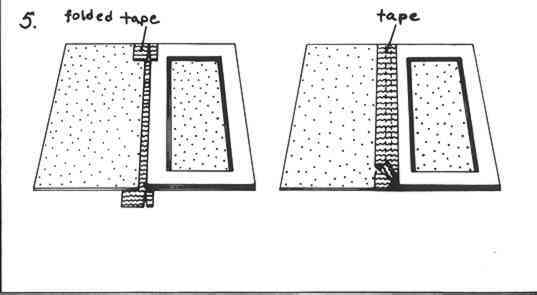 They are folded, rolled and piled into wooden trays that were designed for archaeological lithics and ceramics (Fig. 1). Fig. 1. 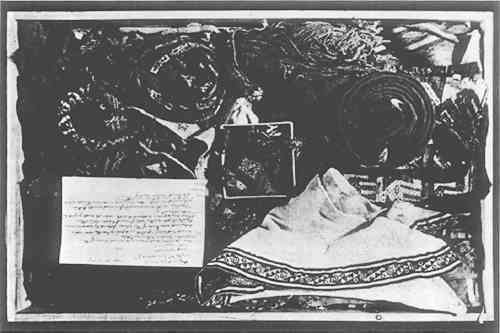 A sample of the present storage conditions. In 1977 the author with the assistance of a museum volunteer, Wendy Shah, began a project to develop a storage container for the collection that would alleviate the poor conditions while not requiring massive time and expense devoted to needlework. Inspired by a matted folder decades old we designed a modular set of containers that could accomodate 90% of the collection based upon a 10% random sample (Fig. 2). Fig. 2. Various sizes of the new containers. FIGURES 3 THROUGH 5 show the construction steps of the basic container. It has a backboard, mat and lid of acid-free ragboard. The backboard and lid are 4-ply while the mat is built up to the thickness of the textile fragment. The interior surfaces of the backboard and lid are faced with muslin. 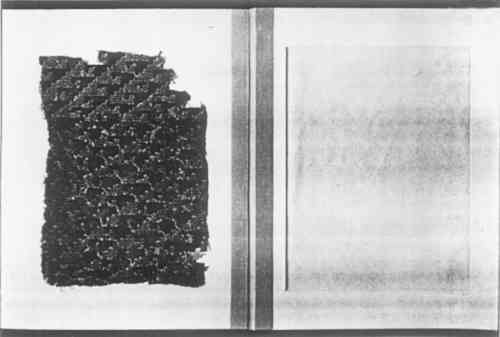 A textile fragment is held within this container between the two muslin surfaces. The mat surrounds the textile in its third dimension keeping excess pressure from it. In this unit stitching is optional. The textile is laterally immobilized by friction-contact with both muslin surfaces. This allows for complete viewing of both the obverse and reverse surfaces of the textile. Its container can be opened from either the front or the back as the muslin-to-textile friction/contact inhibits sliding or bunching. There is no need to manipulate the textile during viewing. Merely by turning over the closed container can the viewer gain access to both sides of a specimen (Figs. 6 and 7). Fig. 3. Construction of backboard for basic textile container. Fig. 4. Construction of lid. Fig. 5. Method of attaching lid to backboard. Fig. 6. Container opened by lifting the lid to show obverse side of textile. Fig. 7. Same container and textile viewed from reverse by opening container from its backboard. There are two variations on this basic unit. Long, narrow weavings are partially rolled and housed in Ethafoam¯4 blocks that are adhered to the basic container. (Fig. 8) This enables more efficient use of storage space while providing easy access to at least one design repeat. The largest container size, capable of holding textiles up to 60 cm. by 90 cm. in dimension, requires additional rigidity. To provide this, a 3 1/6;″ thick laminated foam sheeting material, Fome Cor¯ board, is used as the backboard for containers of this size. Fig. 8. 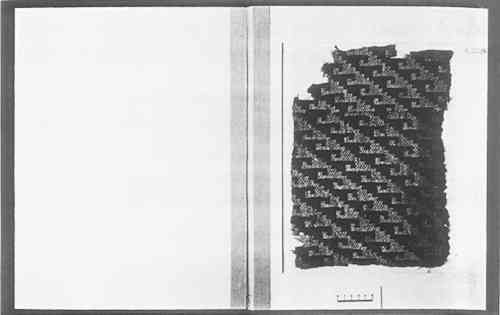 Construction of container for long and narrow weavings showing the textile partially rolled in an Ethafoam¯ block. 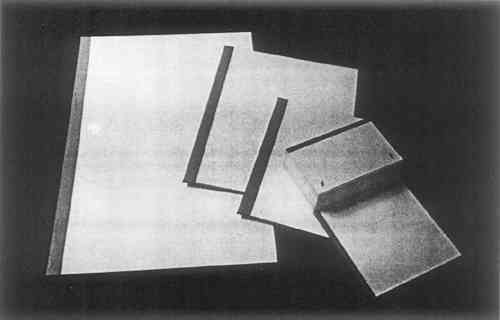 THE MATERIALS OF CONSTRUCTION were selected for inherent stability and permanence with the exception of Fome Cor¯ board.5 Since its paper facing is acid, its internal surface should be covered with Mylar¯6 or aluminum foil to stop vapor migration to the textile. The mat, lid and backboard are of acid-free, buffered ragboard. The muslin is washed and unbleached. 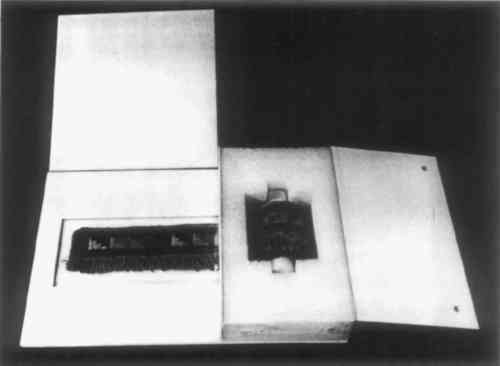 The hinge is composed of starch-sized linen book-cloth. The adhesives used are Jade 403¯7 and a poly-amide heat-set tissue8 commonly used in document conservation. The Jade 403¯, a PVA emulsion, adheres all components of the backboard together including the muslin which is adhered only under the mat away from contact with the textile fragment. This adhesive is also used to adhere the Ethafoam blocks to the basic units when constructing containers for long and narrow textiles. For a strong bond the Ethafoam surface needs to be washed with a degreasing solvent, roughened and clamped. This adhesive is also used in hinging the lid to its backboard with the linen bookcloth. 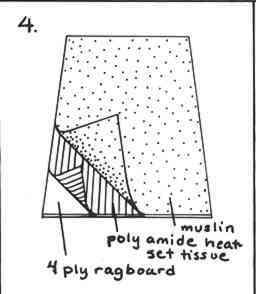 The other adhesive, the poly-amide heat-set tissue, is used solely to bond the muslin to the lid. Ethafoam was selected for its presumed chemical inertness as expanded polyethylene and for its ease of cutting. THE AVERAGE COST per container is low. Materials alone cost approximately $3.35 in late 1977. In-house assembly time requires 45 minutes to one hour per container. All operations susceptible to machine execution, such as ragboard cutting and heat sealing, can be contracted; their cost is included in the materials cost. As has been shown elsewhere,10, 11 the enclosure of an object in a small airspace or micro-climate with hygroscopic materials can cushion against sudden external humidity fluctuations. To test the humidity buffering efficiency of this textile container design a simple test was devised. Twelve containers were acclimated to an ambient room humidity of 28–30% RH and were fitted with one or more strips of humidity-indicating paper.12 These strips, also acclimated to the above RH, were inserted between the lid and mat of the closed containers. The containers were then stacked as they might be under real storage conditions and placed within a sealed chamber where an 80–85% RH was maintained using a saturated salt solution. Over time the humidity-indicating strips were withdrawn from the textile containers without opening them and without disturbing the humidity of the test chamber. By this method, a visual inspection of the strips indicated roughly when the internal humidity of the airspace of each container became equilibrated with the high humidity of the test chamber. The strips withdrawn from the containers were compared with one kept in the test chamber at 80–85% RH. Two recording hygrothermographs, one in the chamber and one in the room, were used to monitor any temperature or humidity fluctuations during the test which might bias the results. Not until three days had passed did the containers' humidity begin to rise and it was not until the seventh day, making comparisons every twenty-four hours, that all containers had equilibrated to the humidity of the chamber. It should be noted that the top two containers in the stack equilibrated more quickly, especially the topmost, which has the greatest surface area exposed for absorption. These required only four to five days to reach the humidity of the chamber. Assuming that the moisture content of the textiles alone would equilibrate very quickly, within twenty-four hours, then these textile storage containers are shown, even by this crude test, to provide micro-climates with significantly reduced rates of humidity fluctuation compared with the macro-climate. Though more accurate determinations are needed, it is the opinion of the author that the humidity buffering ability of the containers would decrease to safe levels all short-term fluctuations (daily and weekly) if the storage room temperature is not widely fluctuating also. One could also expect that as long as a container is kept closed when not in immediate use and kept in stacks grouped within storage cabinetry, its seasonal RH range would be far less than that recorded for its storage room.